My two favorite candy holidays are Halloween and Easter. There's just some awesome candy that shows up during those two times of the year. I love all the new Hershey Kiss flavors that are coming out. When I saw Pumpkin Spice Kisses I immediately grabbed two bags knowing that I would bake something with them. 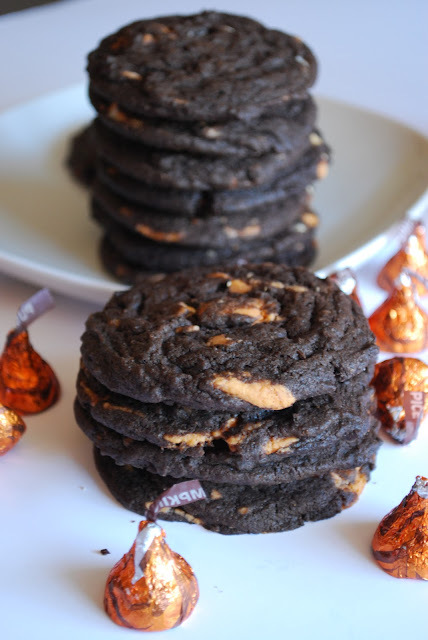 Then I remembered seeing this recipe for Chocolate Pumpkin Spice Kiss Cookies on Barbara Bakes last year. I did these cookies a little different than from Barbara. I roughly chopped the kisses and then added them to the cookie dough. While I think they tasted really good and added a nice pop of orange color to the cookie, I think next time I bake them I will do it Barbara's way, by stuffing each cookie with a kiss so that you have a nice, sweet, spicy surprise. In medium bowl, sift together flour, cocoa and baking soda. Set aside. In large bowl, combine sugar, brown sugar and butter; beat until light and fluffy. Add vanilla and eggs; beat well. Add flour mixture; blend well. Stir in chopped kisses. Using a medium sized cookie scoop, place dough 2 inches apart on Silpat or parchment paper lined cookie sheets. Bake at 375° for 7 to 10 minutes or until set and slightly cracked. Cool 2-4 minutes on cookie sheets and then remove. Cool on wire rack for 15 minutes or until completely cooled. I made about 2 dozen cookies. Oh these just look PERFECT right now! Wow, I didn't know such Hershey's Kisses existed! How did I miss these Kisses?! I am going to have to go on a hunt this weekend, because they sound amazing! Love the cookies! Woozah! I've never seen those kisses, but can assure you I'll be looking for them now!